I’ve been suffering dying with the flu all week, so I have nothing but complete admiration for Sarah Jessica Parker, who braved the cold night air to show off her fabulousity. I love the colour on her. It really brings out her eyes. 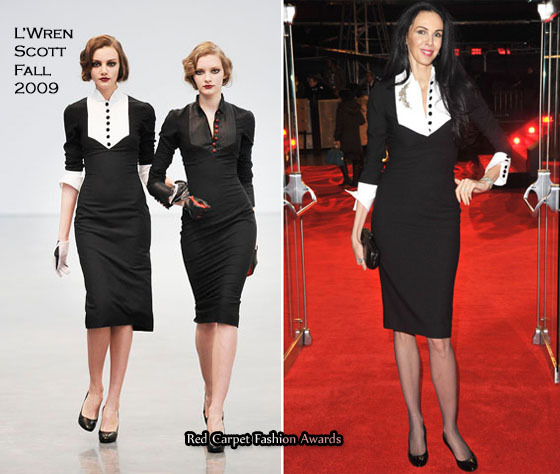 The fit, like any L’Wren Scott dress is exquisite. What I also love is her stunning S. J. Phillips reptile necklace which snakes around her neck. She adds even more glamour to her look by wearing Charlotte Olympia platform heels. Big poufy side swept hair completes this fabulous look. Even though SJP did brave the cold, she didn’t have a coat too far away. She kept warm wearing a luxurious forest green L’Wren Scott Fall 2009 velvet coat, which was accessorized with a fuchsia floral detail and a matching hat which was tilted to one-side. Designer/Stylist L’Wren Scott was also at this premiere. The 6ft 4in former model opted for patent ballet flats with a tuxedo-style dress from her own Fall 2009 collection. The dress was accessorized with a stunning brooch and a black clutch.